Times are tough (or so the media keeps telling us) and you know I love a good bargain so I though I’d share a wine that consistently delivers a good value and we enjoy at stately Fred Manor. 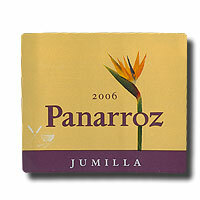 It is Panarroz Jumilla Red and we’ve drunk the last three or so releases under this label. The current release is 2006. Panarroz is a Spanish Red from the region of Jumilla. The majority grape is Mourvedre, with some Grenache and Shiraz thrown in for good measure. At 14% alcohol it is not too hot and it is unoaked, so there is no chance of the overwhelimg oak flavors (Oak Monster as Gary Vaynerchuck would say) that are the bane of cheaper Spanish Reds. It has lots of dark fruit flavors- plum, blackberry, black cherry and a hint of pepper on the finish. It’s medium bodied and has smooth, silky tannins. A terrific everyday food wine. The Emperor of Wine (I.E. Robert Parker) has listed the 2004, 2005 and 2006 as best values each year in his publication The Wine Advocate. He gave the 2006 release 90 points. Now it may be presumptuous of me to go against the almighty RP, but in the end as I always say you’ve got to trust your own palate. Anyway I don’t think its quite that good. I’d go 88-89 points, but whichever way you spit its still a great wine at a great price. They make 1.2 million bottles of this stuff so it should be easy to find. The price is under $10 a bottle and I’ve seen it for as low as $6.28. Enjoy. Perhaps sir could help us out by telling us WHERE he has seen it so low…? Unfortunately that find was at a wine store in New Jersey by my Mother in Law’s. Frederick Wine House has it as does the Spirit Shop for around $9-10 a bottle if I recall correctly. You don’t know your own power. Both Spirit Shoppe and Wine House were sold out. The owner of Wine House told me she wouldn’t be getting it back in because “it didn’t do well in our tastings.” Oh HO!